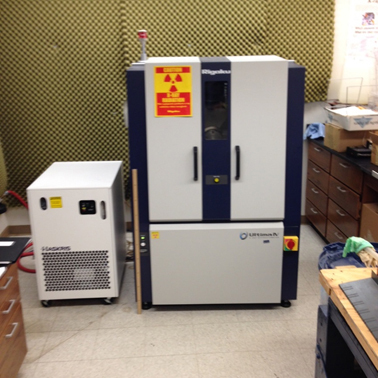 The department possesses a Rigaku Ultima IV, a workhorse theta-theta style powder diffractometer. Purchased in 2011, it comes with a selection of sample mounts and modern software for data interpretation. X-ray diffraction is a century-old analytical technique, which means that modern instruments contain 100 years' worth of streamlining and optimization. The XRD is a simple instrument that still provides invaluable information about geological materials. We use it in Mineralogy (GEOL 310) as an accessible example of analytical instrument, so student use of the XRD is possible and welcomed with some essential safety training. Below are some data derived from a Costa Rica basalt collected in the late 1990s. The PDXL software has identified a midrange plagioclase ("calcian albite") and augite pyroxene as the two dominant minerals in this specimen. On the left, the peak locations for the two minerals identified are shown below the raw diffraction pattern. By comparing magnitudes of the dominant diffraction peaks in the pattern, the software has generated an estimate of the quantity of each. We also have the capability to use a much more sophisticated treatment called Rietveld refinement to model the diffraction pattern if the data and problem to be solved warrant.